These days when someone looks to change their job they work on polishing up their LinkedIn profile, actively adding recruiters as their connections, asking colleagues and supervisors for recommendations. These have become fairly well established as a method to create a professional profile online. While there is a justifiable focus on LinkedIn there is another social network that helps find job opportunities. And that is Twitter. A Twitter page is commonly mistaken only for the sake of sharing constant public posts and pictures and following Celebrities. But most people are unaware that the Twitter can also help in their online job search. Anyone with a valid mail account can register in Twitter account. And steps to open Twitter account are as follows. To start your job search using Twitter you’ll need to open a Twitter account. For that go to the Twitter website twitter.com and start signing up by giving the details in the login page. Provide all details for your personal profile to be created. Details like first and last name, Phone or email and a password of your choice. The verification stage of any form filling is mandatory. Therefore, while filling all details the candidate is supposed to provide valid email details. So that the account holder could handle the activities of the Twitter account. After receiving a Twitter account activation message on email, the account holder can log in to their Twitter account without any issue. Now you are set to start your job search with Twitter. 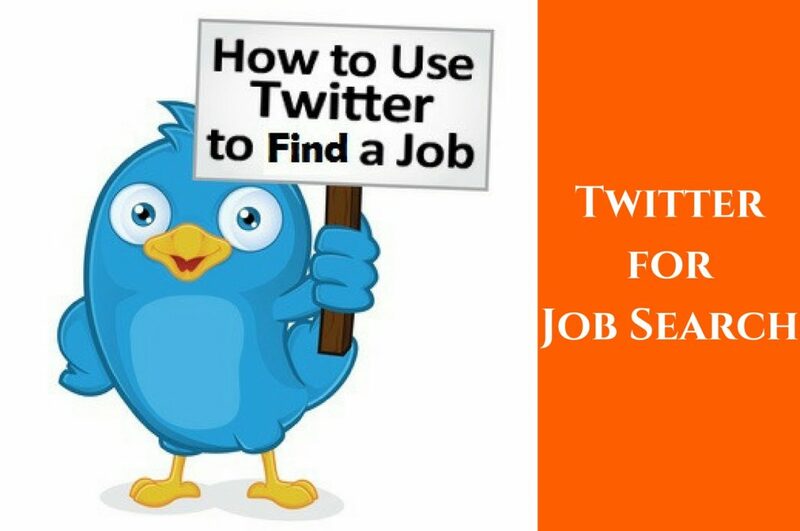 Twitter often provides better job opportunities as compared to the rest online job markets, provided job seekers know how to use Twitter effectively. If you are searching for a job on Twitter, the first thing you should do is to post some of your professional and experience details on your Twitter profile. And once everything relevant like a location, Bio headline summary is posted, then there is a possibility that any interested employer, registered on Twitter can contact you directly. To get more out of Twitter you’ll need to reach out to your targeted employers and Twitter allows that in a wonderful way. If you don’t have a targeted list of employers then take some time and make a list of companies you want to work for. Then follow these companies or their career pages on Twitter. By following them on Twitter, you will start receiving notifications regarding their professional updates especially with regards to job openings. A quick an easy way to power your job search is to identify and follow people you want to work with or are working in organisations who are your targeted employers. Often following people on Twitter results in a “follow back”. Once the person follows back, you can send them a private note seeking an introduction or conversation. Job hunting is a process which requires patience and intent. Therefore, here are some of the job hunting ideas using Twitter. One of the best ways to search for a job is that you just directly start searching for your targeted employer’s Twitter account. Listing all those companies will provide better chances of tweeting to those companies with a professional note. If you are pro-active you can tweet to some of the companies and create an outreach effort. While tweeting, make sure you subtly highlight some of your achievements, skills or credentials. Twitter is a very effective advertising medium and you can leverage some of it to share very targeted tweets to improve visibility with the right set of employers. Remember many employer twitter handles would have “followed you” and if they are hiring for the skills you have then your profile will stand out on their feed. Digital marketing is becoming critical for organizations and their right to win in the market. In this environment if you want to work for some of the best employers how do you leverage some of the same techniques of digital marketing. Employers these days will anyway check your social profiles before they make any decision. Having a great online presence and brand makes it easier for them to hire you. If you want to get specific attention from employers do something to draw their attention. You must understand the value of posts, retweets and comments on Twitter. Any tweet that highlights your abilities piggybacking on other popular or highly retweeted tweets tagged to carefully chosen employers can help get attention for the skill and work contributed by the user. When you start searching for a job using Twitter, then prepare to get notified and updates regarding all the activities of the company. You will get a ton of notifications not all of them relevant but a few might be the really important ones that you need to act on.Therefore, read through the notifications and act on the ones that you need to. Nowadays, people use Twitter as heavily as some of the other social networking websites. All Twitter users tweet about current event, social affairs and much more. And in return they expect others to retweet. This ultimately increases their views and benefit them in some terms. Increased views of your tweets leads to increase number of followers, comments and improved visibility. If you want your appeal to spread far and wide, build followers and views. You can do this in a few easy ways. To draw attention to one’s Twitter account, use some interesting name as your Twitter handle. For example, some Twitter user takes their initials as their Twitter name but instead of that you can also mention their profession as a Twitter name. Fortunately, this will be helpful at the time of searching a job opportunity as well. Therefore, the user is required to choose a unique Twitter name to differentiate themselves from the rest. When one normally starts using Twitter account, then they are expected to start with something simple and easy initially to get the hang of Twitter. Therefore, if a user is supposed to search jobs, then he must post something related to his professional area regularly. This will create followers and views of this kind designed to attract employers. Twitter users use #Hashtag while posting any statements on the Twitter. Therefore, if a user is trying to search for a job, then while publishing any statement make use of Hashtag symbols to connect with people. The main reason behind using such Symbol is that they connect to a different group of people. For example, #CEO, #marketingmanager and many more. Every social media networking websites maintain their community groups. These community groups deliver work related to a unique agenda of the group. And the main agendas of the community is to contribute their knowledge and information with the rest of the team members. The equivalent of this on Twitter is the List, while this is different from groups and communities in different social sites and the beauty is that you can access anyone’s lists whether they follow you or not. So search for targeted lists or create a list of your own and tweet them. While doing your job search and building your brand you end up benefiting in your own way. Twitter helps you build your own network of people who follow you or associated with you during a period of time through hashtags. The great thing about Twitter is that you can follow new people that you meet and get follow backs. Just like you exchange business cards and connect on LinkedIn, make an effort to follow all professional contacts and get follow backs. Twitter is a medium of instant feedback’s. The Twitteratti are quick on their fingers and very vocal with their opinions. If you shared something that struck a chord with the network you will get an astounding amount of tweets and followers. The double-edged sword that social media is anything that doesn’t agree with the Twitterati will also cause a push back to you. Twitter users constantly deliver statements about certain events in a daily life. Through a series of words, pictures, videos, opinions, news and thoughts they make our life more colorful. Twitter may be euphoric, sad, excited, angry and a lot more but its hardly boring. No matter what, you’ll enjoy your time on Twitter. It is not necessary that all the Twitter users who opened an account in the social media website display all true facts about themselves. Moreover, there is a possibility that most of the Twitter users share fake information about themselves on their Twitter wall. Therefore, job seekers must be careful before exchanging any sort of information with anybody on Twitter. The chances of being fraud are higher than any other social media website. Twitter is a brief medium and most of the users have only a few details about themselves. It’s just possible that just like the “Chain emails” seeking money from you to help someone in a Distant Country, Twitter too is not immune to scamsters and Fraudsters. Twitter accounts can be closed easily and new ones can be opened, so before you publicly declare or share private information about yourself or your job be mindful if that information can be misused. Twitter users constantly tweet about anything they find interesting online or offline. Most of the users share their photos, videos and funny quotes on their Twitter wall. And some just keep discussing the current situation in the world. Therefore, Twitter is a loop of constant tweet wherein which people get themselves stuffed because of no good reason. For those who are seeking how to add some extra punch to their job seeking adventure, Twitter can be an interesting tool that helps reach out to specifically targeted employers and hiring managers. While on this journey the experience of being a part of Twitter itself will make your life more colorful.